As a stranger in a strange land, the days when your national holidays come around are strange times. There is no fanfare, no celebration. It’s a bit like It’s a Wonderful Life, where everybody around you has forgotten who you are…or what a significant day it is. Except they’re not pretending, they have no reason to pretend. You live in another country now with another history and a whole new set of significant days. These days of historic-memories past can feel lonely. You feel outnumbered. You are outnumbered. No one else remembers softball in the pasture with aunts, uncles, cousins, or grandparents. No one remembers the yearly angst your mother had as your brother lit fireworks off the end of a PVC pipe at the end of the driveway. You never cared much for them before, but now you would give up a whole month of European treats for a Jell-O salad or watermelon slices. A good hotdog grilled by a man in a baseball cap and cargo shorts would be balm for the soul. The words “Mustard and ketchup are on the picnic table,” would be like hearing a prayer, and the sight of all of the wasteful paper and plastic utensils might bring a tear to your eye. Whenever I am tempted to throw myself a Pity Party, I lean heavily upon my imagination. Imagine Erin, I tell myself, that Frans lives with you in the States. It’s April 28th and yet people are going to work as usual, no one is wearing orange, and few have ever heard of King’s Day. Business as usual. Except that because King’s Day is like a nationwide garage sale, I would also be in mourning. I dearly love garage-sales or any other kind of secondhand treasure hunting.This is the life we have signed up for, this cross-cultural marriage of ours. Last Fourth of July I celebrated with international Dutch language classmates at my house. It was rainy and fairly chilly as it can be in July in the Netherlands, so we gathered inside. My Iranian friend wore an American flag t-shirt but told me not to post photos on Facebook. “I’ll get in trouble,” the person said, half-kidding. Frans was a trooper and grilled outside with an umbrella. The night wore on, and everybody politely tried my potato salad and deviled eggs. I was pregnant but not telling anyone yet, so I tried my hardest to appear to sip my beverages while slipping Frans the rest while the others weren’t looking. This year, Estella and I went for coffee with a Dutch friend, Aukelien and out for burger with my American expat friend Kathy. 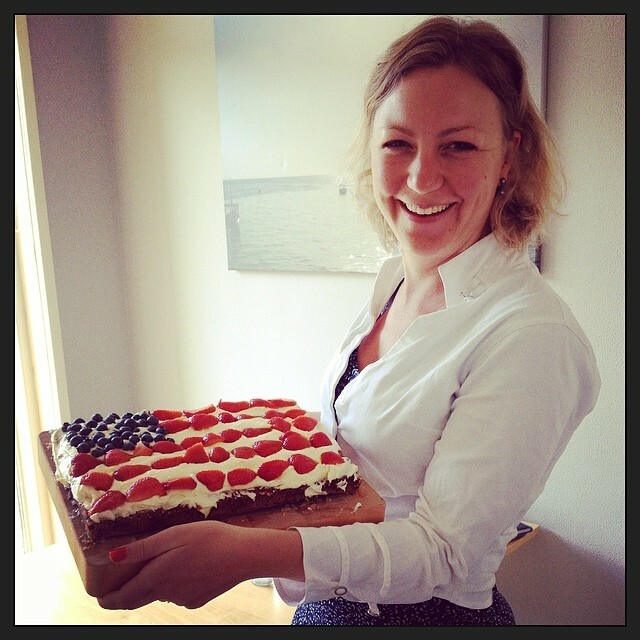 When I arrived at Aukelien’s place, she greeted me with an out-of-this-world delicious carrot cake decorated with the American flag…strawberries and blueberries. I didn’t cry, but I felt like it. The first thing she said to me after I saw the cake was, I can imagine if it was me in America with King’s Day…love and kindness thy name is Aukelien. She’s my Dutch twin, I say. Afterwards, I got to meet up with my American friend Kathy who is also married to a Dutchman and living the cross-cultural life. She wore a red shirt with the American flag. We spoke bold American English and prayed over our meals. 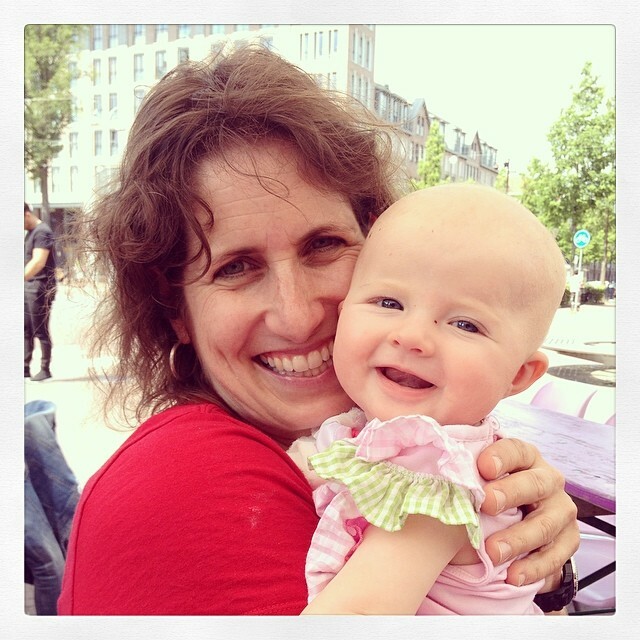 We shared…she held Estella and Estella loved it. We talked about life and family and cross-cultural experiences. It was like balm. She’s my sister from another mister. I loved my Dutch-American Fourth of July. I’m away from home, but by no means alone. Hi Erin! Happy Fourth! I’ve read your post to my family and everyone’s getting teary! You’re such a talented writer. Glad you’ve had a good day. Ooooh, you are writing again!! Aukelien pointed me to this post. What a dear friend she is, just thinking ahead and thinking beyond herself. Yes! And I hope to write another one today. Thanks for reading, Maddy Christine! Do you write as well? Liefs! Thanks, Maggie! My mom told me about your writing as well…let’s follow eachother!